Gaslighting is a form of mental abuse in which information is twisted or spun, selectively omitted to favor the abuser, or false information is presented with the intent of making victims doubt their own memory, perception, and sanity. Instances may range simply from the denial by an abuser that previous abusive incidents ever occurred, up to the staging of bizarre events by the abuser with the intention of disorienting the victim. The term comes from the 1944 movie Gaslight, starring Ingrid Bergman. 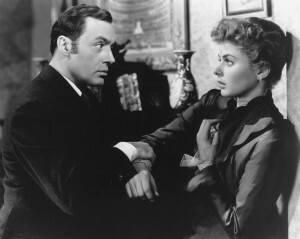 In this movie, the villain, Gregory Anton (Charles Boyer), marries Paula (Ingrid Bergman), to gain access to her home. He starts moving items, and accuses Paula of taking them. She, of course, doesn’t know where they are. Then they reappear, and Gregory says Paula is losing her mind. She eventually has a breakdown. When I first watched the movie, I thought the Gregory character accurately portrayed an abusive sociopath. Still, I thought the idea that he would intentionally remove items and make them reappear was a bit far-fetched. Then I started hearing from Lovefraud readers who described exactly that experience. One woman told me her sociopathic partner kept hiding her keys, and then accused her of being mentally ill when she couldn’t find them. A man told me that the woman he was with would move his possessions, then accuse him of being forgetful. The guy moved in with her and immediately started taking things chocolate, documents, books. When she asked him where they were, he claimed not to know. Then the items reappeared. Luckily, members of the Reddit community educated her about gaslighting. The end of the story tells how she dealt with it, which is truly priceless. That’s interesting, Donna. I don’t remember that part. Mind you, it’s probably a good ten years, maybe longer, since I saw this fine old classic movie with Ingrid Bergman. What I do remember was that the “gaslighting” from which the movie took its title was actually an unavoidable side effect of what the villainous husband was doing in pursuit of his real object. The necessity of concealing his true motives obliged him to deny what was happening, which disoriented his wife. However, from his viewpoint this disorientation was a bonus, since his wife’s confusion rendered her less likely to see what he was really up to. In short, I hadn’t remembered that Boyer, the husband, had also indulged in practices aimed explicitly at disorienting his wife—not merely as a side effect of his other activities. That’s the only thing I remember about that movie! Yet it stuck in my mind forever after. I even remembered how to spell that line! 🙂 I guess it’s the only thing I got a laugh out of. If anyone happens to know what this movie was, I’d be grateful to have my memory refreshed. It just struck me that the plot of the Sherlock Holmes story The Three Garridebs, which by coincidence I just reread a few days ago, bears an (admittedly distant) similarity to that of Gaslight. Not least is that the poor victim of that story too, Nathan Garrideb, ended up losing his mind due to the machinations of the villain. Naturally my first reaction to this article was to take another look at Gaslight, which like all great movies, is always worth seeing again. But alas and alack! woe is me! the DVD collection jumps straight from Gangs of New York to The General’s Daughter. Just as bad, the (older) VHS collection hops from The Game to Ghost. In short, there’s a gap in the middle of both where Gaslight ought to be. We must have rented the copy we watched ten or a dozen years ago, back when outfits like Blockbuster were still in business. I’ll just have to order a copy, that’s all. It belongs in any self-respecting movie collection. Redwald – The villain in Gaslight was definitely taking things. That’s what led to the big breakdown scene. Dammit, the Edit function is hiding again. “Italisn” should of course read “Italian.” But I’m sure our readers are more than bright enough to figure that out. My son remembers all of these things, mostly good, that supposedly happened when he was a child. Unfortunately, these things did not happen at all! He tends to talk about these make believe events in front of other people, as if they really happened, but never when we are alone, because he knows that I know that they never happened. We all had a terrible family life when he was with us for his first 8 years. He went into care at 8 years old because as a young couple, we did not know how to deal with our son. He lived in an excellent home where he stayed until he was ready to move out on his own, thank goodness. These were almost NO good times when my son was a child. He tells it like there was to any outsiders who will listen. In the next breath, he says that he was in a foster home and although he swears that he does not want people to pity or feel sorry for him, he tries to make them do just that! I can only imagine the lies he has told and tells his so called friends or ex wife and/or girlfriends….and then says out loud (because I’ve heard him say it)…I don’t hold a grudge, look how well I turned out. It’s very confusing. It also includes staging bizarre events to disorient the victim.